If you ask me - one of the very few of the true American thespians, our dearly beloved Patrick Wilson has just joined AQUAMAN movie in which Jason Momoa will play master of the seas! It seems his whole family will be in it, since, beside Amber Heard who will be playing his wife queen Mera of Atlantis, Patrick will be playing his evil brother and the main villain in the movie. He will be his half brother Orm, or Ocean Master. He is fully human, extremely powerful and wants the throne of Atlantis himself. In other words, he is AQUAMAN's Loki. Willem Dafoe is also in the cast and will be playing scientist from Atlantis Nuidis Vulko! The movie will surf up October 2018. almost two years from now. I can't believe it, but another true American thespian and another of our favourite hunks, Chris Evans, is in the news today as well, talk about a hot post: Ruben Fleischer has been brought to direct him in JEKYLL based on BBC's TV series. It is the modern version of the doctor with split personality who lives in a fortified basement with a psychiatric nurse as his ally. She watches him transform into an alter ego who rages, shows heightened strength and speed and can be a charming, flirtatious scoundrel as well. The two personalities try to co-exist, even though one doesn’t remember what the other does while in control of the body. They use a micro cassette to leave messages for each other. As you know, Universal is preparing another JEKYLL project with Russell Crowe. And here's the first trailer for March 3rd comedy movie THE LAST WORD in which Shirley MacLaine plays a very successful retired businesswoman who needs to control everything. So she goes to her local newspaper’s obit writer (Amanda Seyfried) with a plan: she basically will co-write her own death notice — you know, to be sure it gets done the right way. But there’s a catch: She isn’t exactly the town’s most popular resident. 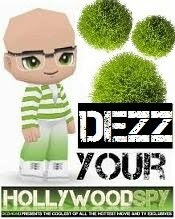 Dezzy, Dezzy, Dezzy, I am disappointed in you. With all the wonderful half-nekkid photos of Chris Evans available on the internet, you had to pick one of him in a SUIT? It's just not fair, Dezzy. IT'S JUST NOT FAIR! I'm a collector of comics but Aquaman is just, you know, lame. There's only one Aquaman and this is this guy: CLICK! I'm with Blue on this one. I LOVED Man from Atlantis when I was growing up. Aquaman comics is lame, but Man from Atlantis is hawt!! those two are not the same? Chris Evans....mmmm! I like Amanda Seyfried, but she tends to be looking very haggard in her last few movies. I think she could benefit from a better moisturizer. 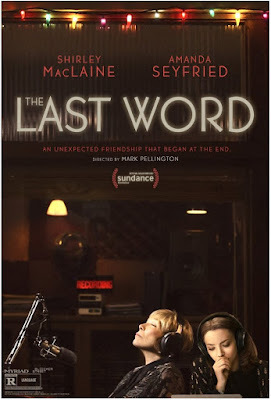 With that aside, The Last Word looks like it might be worth a watch. I just read that about Emmy Rossum. I haven't seen the show, is she the main character? If so, I say raise hell until the money comes rolling in (only if she is carrying the show and it wouldn't work without her). It won't hurt Macy, but will take away from those greedy corporate bastards in Hollywood's pocketbooks. Now, for Amanda wanting more money than Justin in that film. Ridiculous. He was definitely the star and deserved more pay. I think that's why I loved David Schwimmer in Friends when he said the whole cast makes the same per episode or he wasn't taking that raise. They all carried it equally, they all deserved equal pay. Yes, in FRIENDS all were equal, but that does not go for all the shows, like when Robin Wright wanted more monies than Kevin Spacey. I'm pretty sure everybody knows Oscar winning Spacey and turns to watch the show because of him, while 90% of the world has never even heard of Robin, except as an ex wife of that Penn idiot. What!? I hope they are now realizing your worth and are kicking themselves! I hope they are stuck with a crummy translator who turns work on time late and does a sloppy job. Nothing I hate more than greedy people! I am a lover of the cassette so any movie that places it as a center piece catches my attention. Jekyll seems interesting so far and I really hope it turns out to be a really good movie. Good luck Chris. Yeah I'm waiting to hear more on any DCEU movies before I get excited. The first three so far haven't been that great. 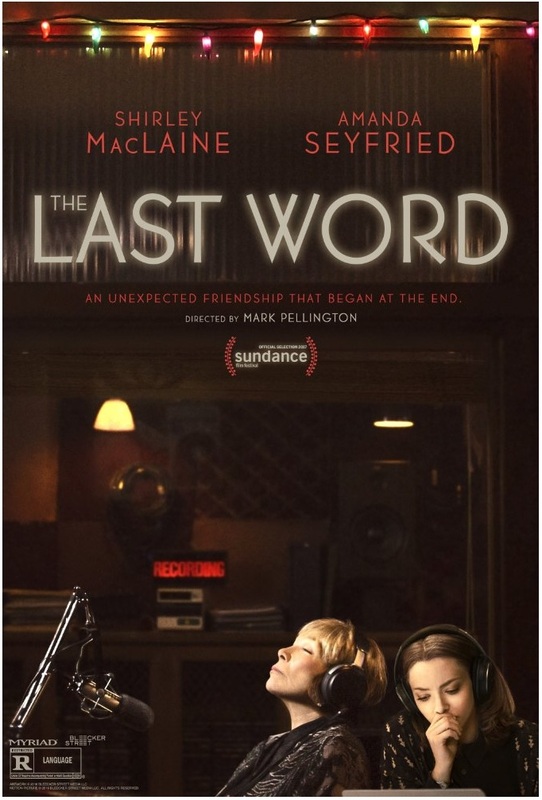 The Last Word trailer is sweet even if a bit formulaic. Grumpy controlling woman discovers fun and life's true meaning in the latter days of her life. I loved the scene when the girl asked if she just lost her job to a 100 year old. Golden! Anyway I'm still bopping over seeing the Despicable Me 3 trailer today. Hopefully you'll cover that soon Dez and tell us your thoughts. No spoilers from my end. I do love the trend of senior actresses headlining films like this one, those are usually the only films with some warmth in them.